Maintaining photosynthetic performance and remobilization of assimilates stored in vegetative tissues are strategies of superior wheat genotypes under drought stress conditions. To better understand the response of vegetative tissues to drought stress at the grain filling period, transcript profiling of genes encoding fructan and sucrose metabolism were studied in the stem (penultimate internode) and root of two drought-tolerant genotypes. Based on a preliminary screening, the cultivars T-65-7-1 (the mutant line) and Tabasi (wild type) were selected for further study with respect to the parameters associated with photosynthesis and stem remobilization under rain-fed conditions. The expression of photosynthetic genes, chlorophyll content and relative water content were sharply reduced in the T-65-7-1 compared to Tabasi, as a result of drought-induced leaf senescence. Under drought stress, fructan remobilization in the stem and root of T-65-7-1 was significantly higher than Tabasi, which was due to the over-expressed genes involved in the synthesis and hydrolysis of fructan, as well as the synthesis, hydrolysis and transport of sucrose. The stem and root tissues depicted similar assimilate remobilization behaviours under drought stress. 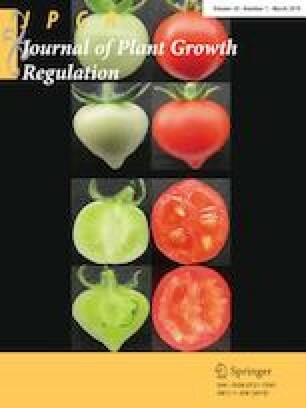 The grain yield reduction was less in T-65-7-1 than Tabasi under drought stress during the grain filling period, therefore, the remobilization of assimilates to the grains was a more effective strategy than maintenance of photosynthesis under drought stress conditions during the grain filling period. This research provides valuable molecular indicators for selecting drought-tolerant wheat genotypes with high fructan content and increased remobilization in wheat breeding programs. The online version of this article ( https://doi.org/10.1007/s00344-018-9822-y) contains supplementary material, which is available to authorized users. This study has been supported by Gorgan University of Agricultural Sciences and Natural Resources.